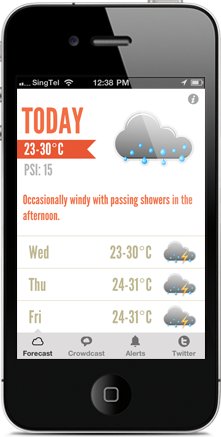 Weather data collected from the most reliable and local sources to bring you the most accurate weather information possible. 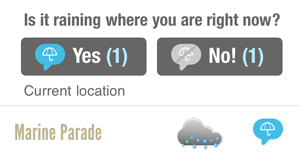 Crowdsourced weather: Predicting weather is tricky business. Our community helps us get it right by updating us in real time! Rain alerts: If it's going to rain, we will try our best to let you know in time to take your brolly along. Flood alerts: Singapore has been known to get flooded. Now you will know when, well in advance. PSI alerts: We can't stop that haze (yet), but we'll notify you if the PSI levels rise beyond the safety point. Special weather warning: The NEA issues warnings when it forsees flashfloods and such. We'll make sure you are informed immediately. Quickly access the @NEAsg and the @weatherlah twitter updates to know what others tweeting about the current weather are saying.